Update: The teaser is actually done on an easy to spot ”cool truck” template found on the web (thanks to _John_ for that) but the image itself was posted by AMD PR. See my comment below for more information. [Caution: Not Confirmed] I noticed something pretty interesting posted over at Planet3DNow. Basically the guys over there have managed to find an AMD PR image that was posted under the #AMDEvolved twitter handle (I couldn’t find the picture myself, but I probably didn’t look hard enough). The picture depicts 12 AMD Robots. Since the robots are an analogy for cores, it doesn’t take a genius to figure out that AMD is planning something with 12 Cores. 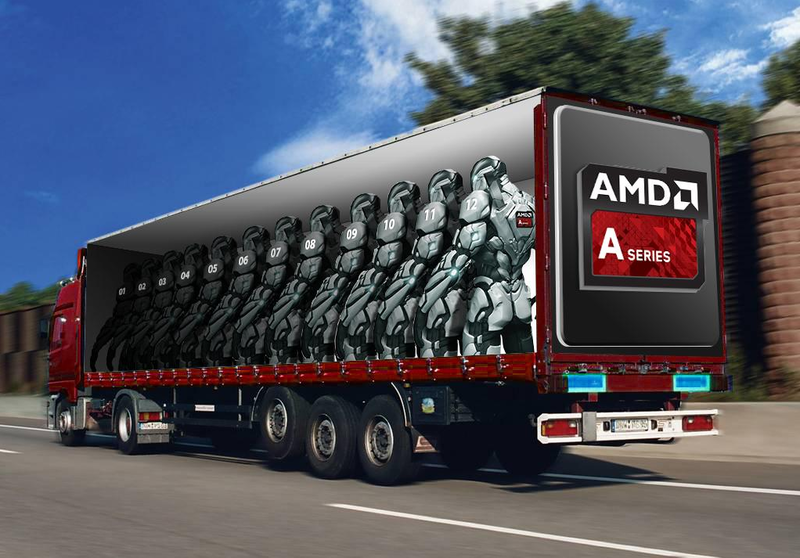 A truck carrying 12 AMD ‘Cores’. The A Series Logo depicting APUs is also visible. Before I let the wrong idea through let me explain why I have tagged it as ‘Not Confirmed’. See, AMD has a very funny way of naming cores. Kaveri has, according to AMD, 12 compute cores. 4 of these cores are CPU and 8 of these are CUs. Ofcourse this is pretty misleading since CPU and GPU cores are nothing alike, but the fact remains. It is possible that these 12 Robots depict 12 Compute Cores as opposed to just 12 Steamroller Cores and I wanted to make that clear. This is also the reason I have tagged the post as not confirmed. An interesting thing to note is that AMD introduced a new ‘robot’ in their “Core is Back” teaser video, which has a red color scheme. However these are the old robots with the standard white color scheme. This seems to suggest that all these robots are on the old steamroller architecture and not a new one. And since Kaveri already exists, boasting a 12 Compute Core A Series APU doesn’t make any sense and therein lies the logical conclusion: the truck must be boasting 12 Steamroller Cores. Continuing on the same train of thought there is another dilemma. AMD has clearly teased the new red color schemed robots so why are these particular robots white? Are we looking at 2 simultaneous releases? Possible but not very probable. I guess it is possible (though this is pure speculation) that we are looking at an architectural revision of said cores. Something, that was symbolized by the robots turning red from their standard white aesthetic, but once again this is anybody’s guess. However, way I see it, the chance of a brand new architecture is much less than an APU with 12 CPU cores. The reason being that documentation of an FX successor with 16 Cores already exists so this could be pretty plausible. A brand new architecture on the other hand would be absolutely huge news if true. Bottom Line is: apart from logical deduction and speculation, we don’t have anything solid. Either way, we are going to be keeping an eye on the #AMDEvolved handle and the AMD’s official youtube channel till this big reveal – whatever it might be.